"Love it, don't trash it!" 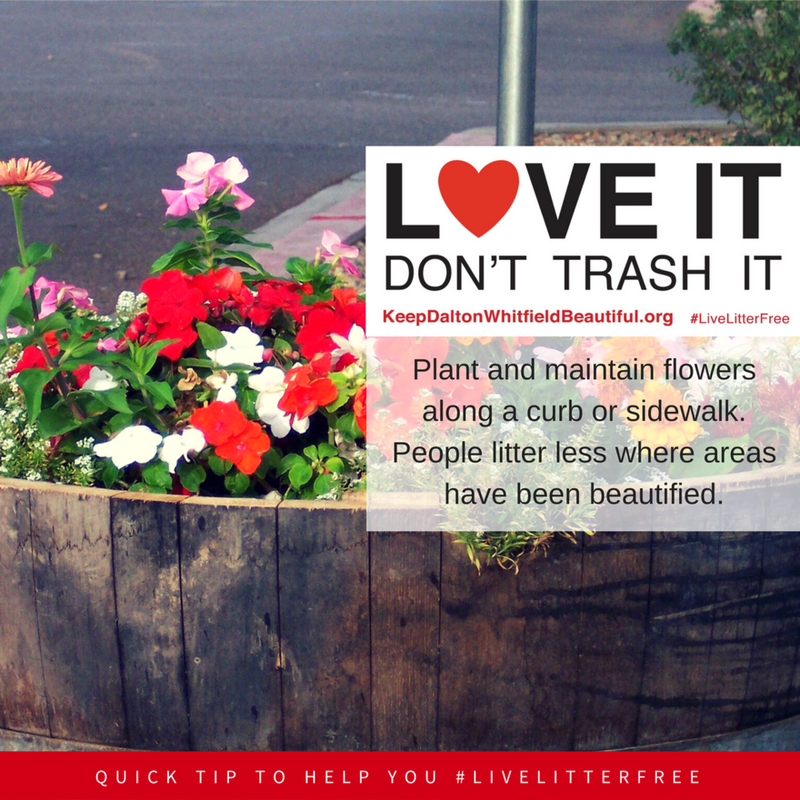 Keep Dalton-Whitfield Beautiful (KDWB) wants your help to keep our community clean and beautiful today, and for years to come. 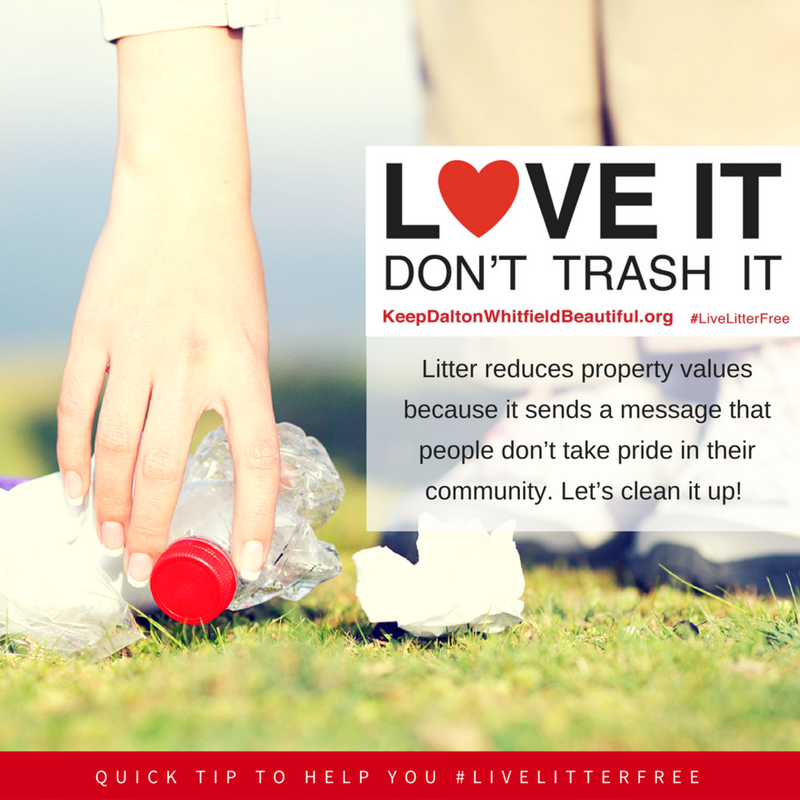 Encourage your friends to not litter and instead love our town by sharing the "Love it, don't trash it!" message on your favorite social media site. Post a photo of you putting trash in the right place, recycling, or picking up litter you've found and tag it with the hashtag #LiveLitterFree. Getting rid of litter, trash in the wrong place, starts with educating people about why it's important to not litter in the first place. Linked below are several graphics and suggested posts that KDWB has developed. Each one is a tip or fact related to not littering. 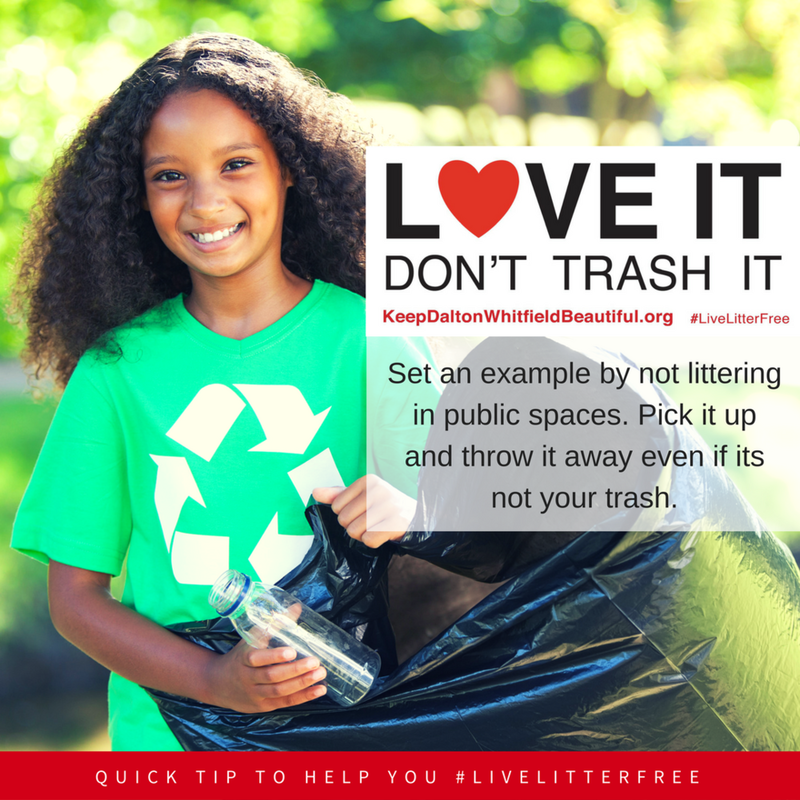 You can copy and post these your own social media sites too - just be sure to include the hashtag #LiveLitterFree, and if possible our website address: http://www.keepdaltonwhitfieldbeautiful.org or Facebook page: https://www.facebook.com/KeepDaltonWhitfieldBeautiful so others can participate. If we all work together we can spread the word about the negative impact of litter and how to change it. 1. 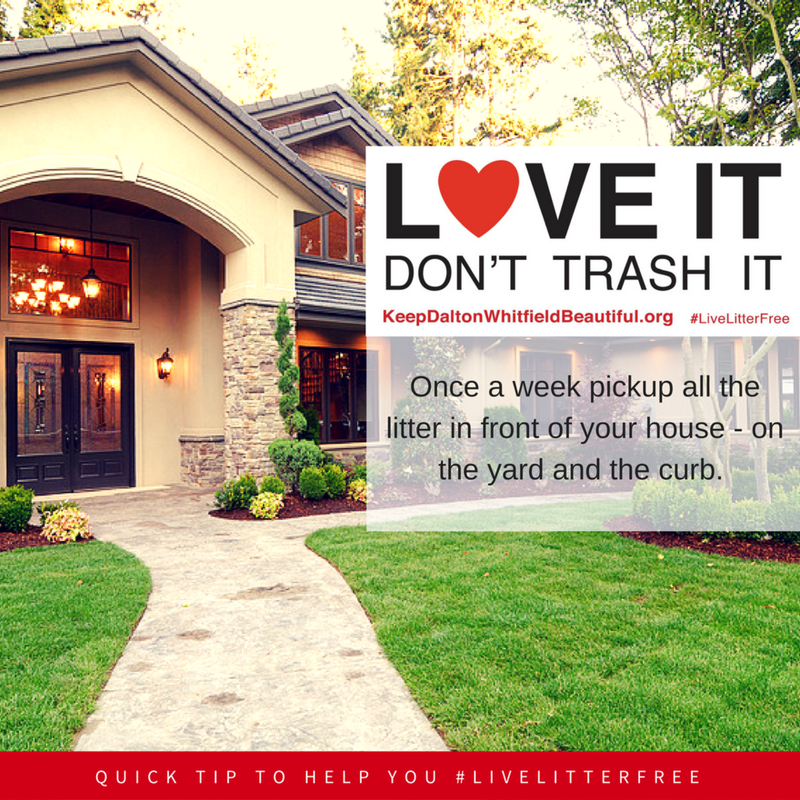 Every week, pickup all the litter in front of your house, including the street. 2. Cigarette butts are litter too! 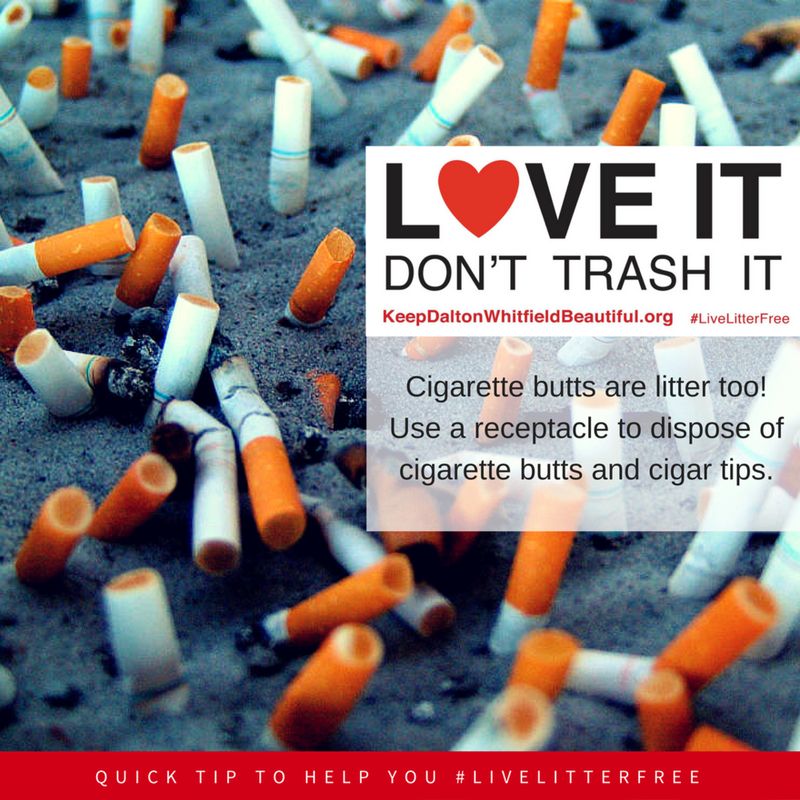 Use a receptacle to dispose of cigarette butts and cigar tips. 3. Plant and maintain flowers along a curb or sidewalk. People litter less where areas have been beautified. 4. Eating fast food in the car? Don’t toss it out the window! 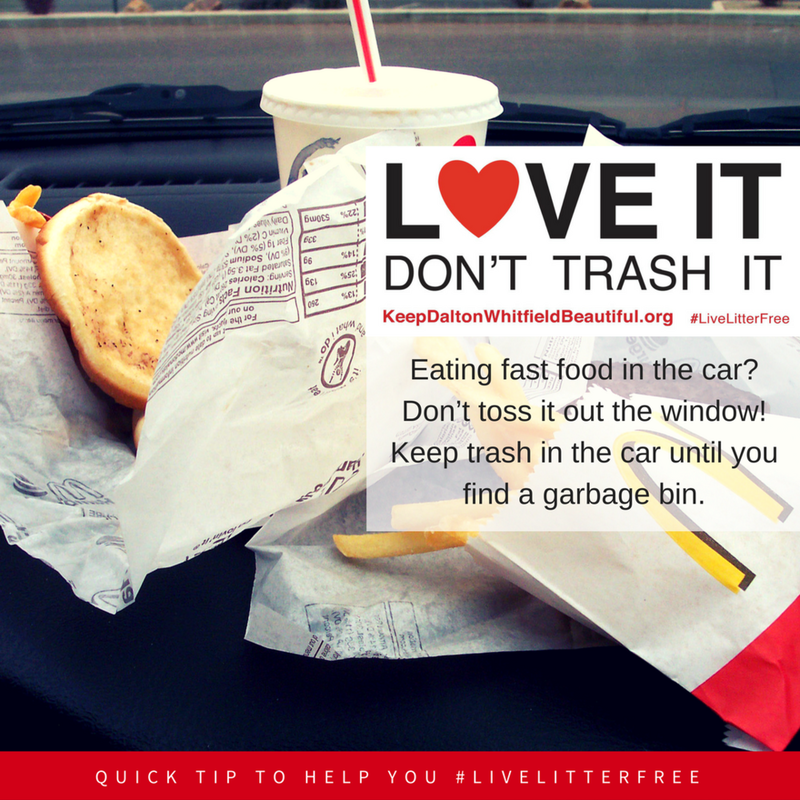 Keep trash in the car until you find a garbage bin. 5. Going to a soccer game? Don’t litter! Use the trash and recycling bins in the arena. 6. Before you light up, identify where to dispose of cigarette waste. 7. When camping remove all evidence of your stay. 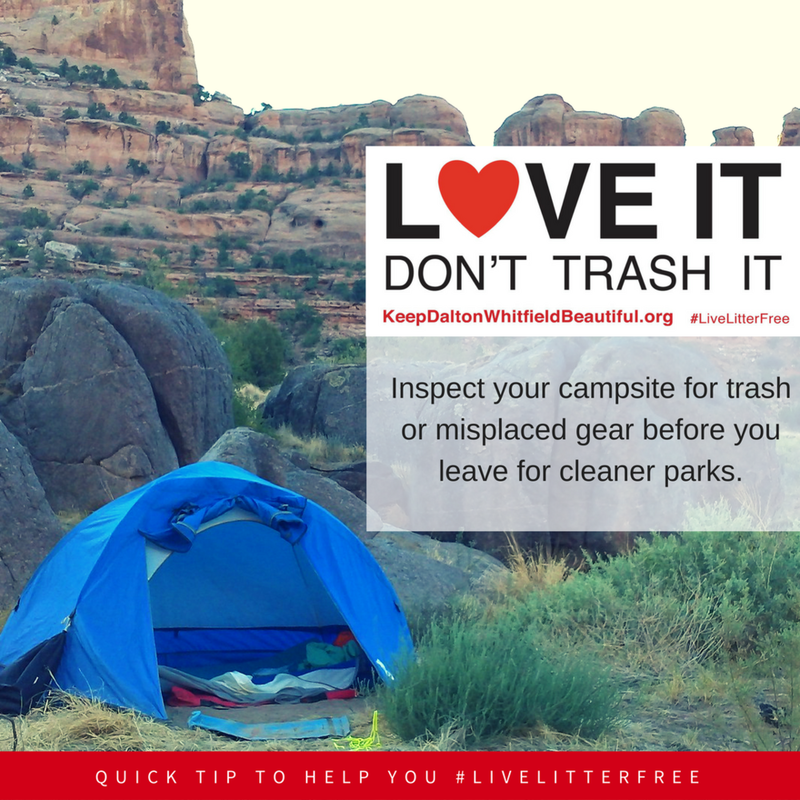 Inspect your campsite for trash or misplaced gear before you leave. 8. Set an example by not littering in public spaces. Pick it up and throw it away even if its not your trash. 9. Refill a reusable water bottle or thermos instead of buying a disposable bottle or cup. You’ll have less to throw away. 10. 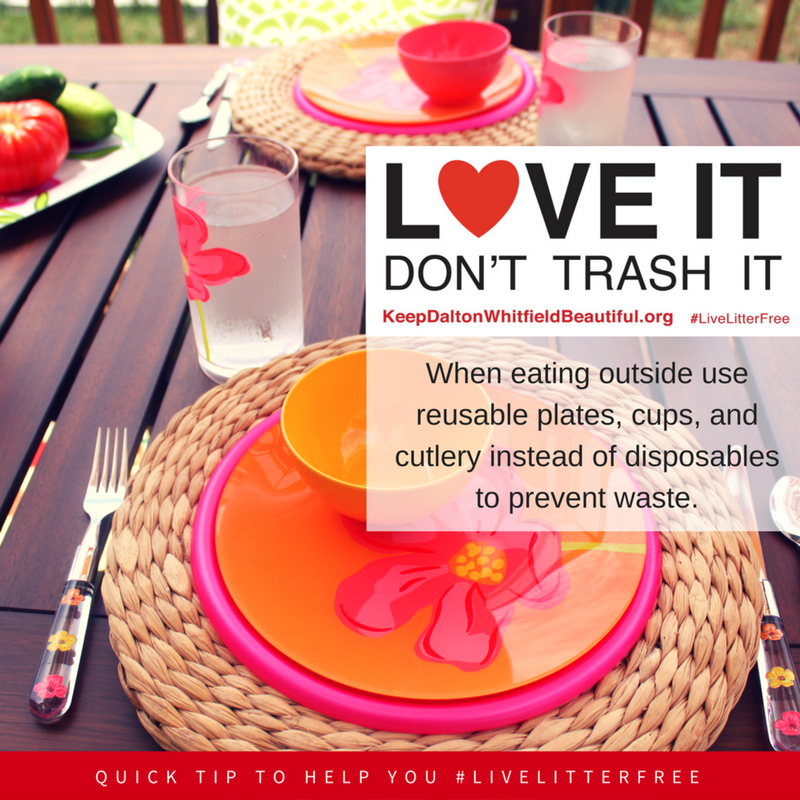 When eating outside use reusable plates, cups, and cutlery instead of disposables to prevent waste. 11. Keep loading docks clean and tidy – prevent trash from being litter on the street. 12. Keep a secure lid on your trash can. Keep trash contained to prevent litter. 13. Keep a trash bag in your vehicle to collect trash while on the road. Don’t toss it! 14. Dog poo is litter too! Pick it up with a plastic bag and throw it in the trash. 15. Pack your recycling bin with light items on the bottom and heavier things on top to avoid littering your street. 16. 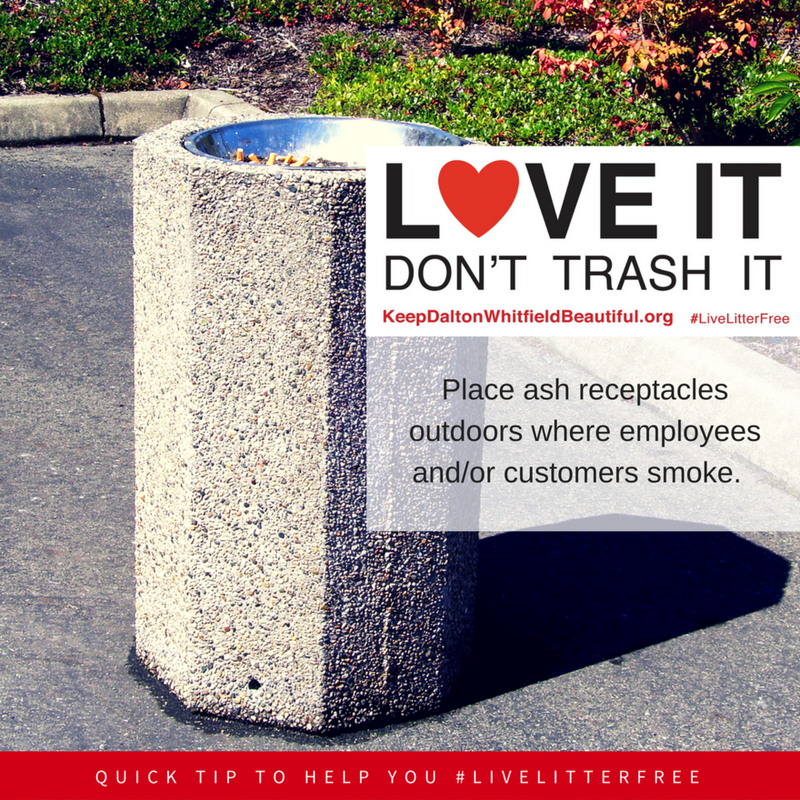 Place ash receptacles outdoors where employees and/or customers smoke. 17. Carry out what you bring in to the playground. Keep trash with you until you find a can. 18. Going on a picnic? Take out what you bring in – leave no waste behind for more beautiful outdoor spaces. 19. 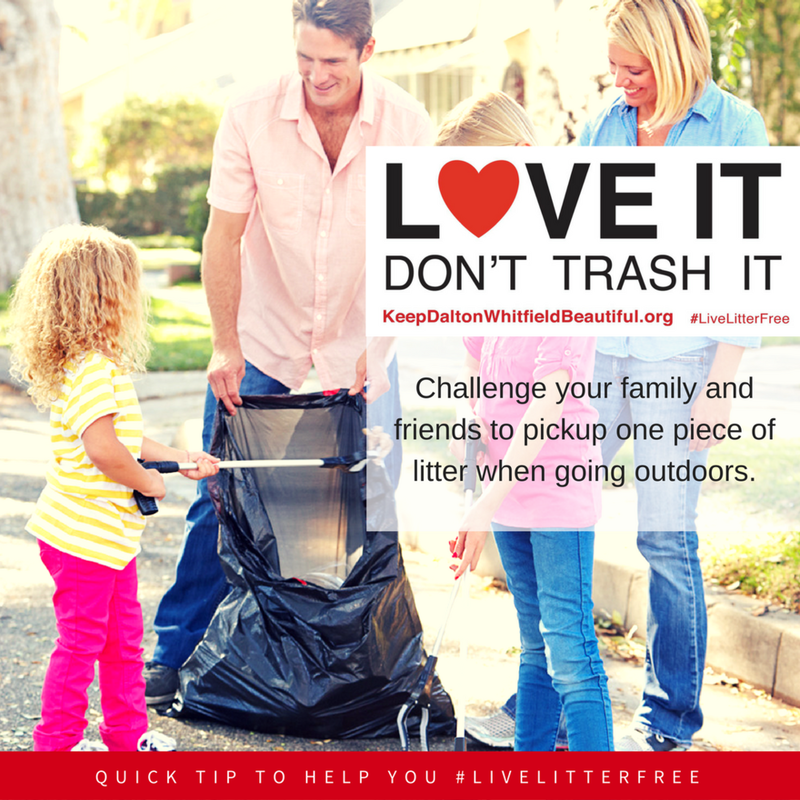 Challenge your family and friends to pickup one piece of litter when going outdoors. 20. Show your neighborhood or favorite park some love this week by doing a quick 20-minute litter cleanup. 21. Secure loose items in pickup truck beds to help prevent litter on the road. 22. Participate in a litter cleanup to help keep local parks and roads clean. 23. Keep trash in a bag until you can put it in a trash or recycling bin. 24. Balloons blow – don’t let them go! 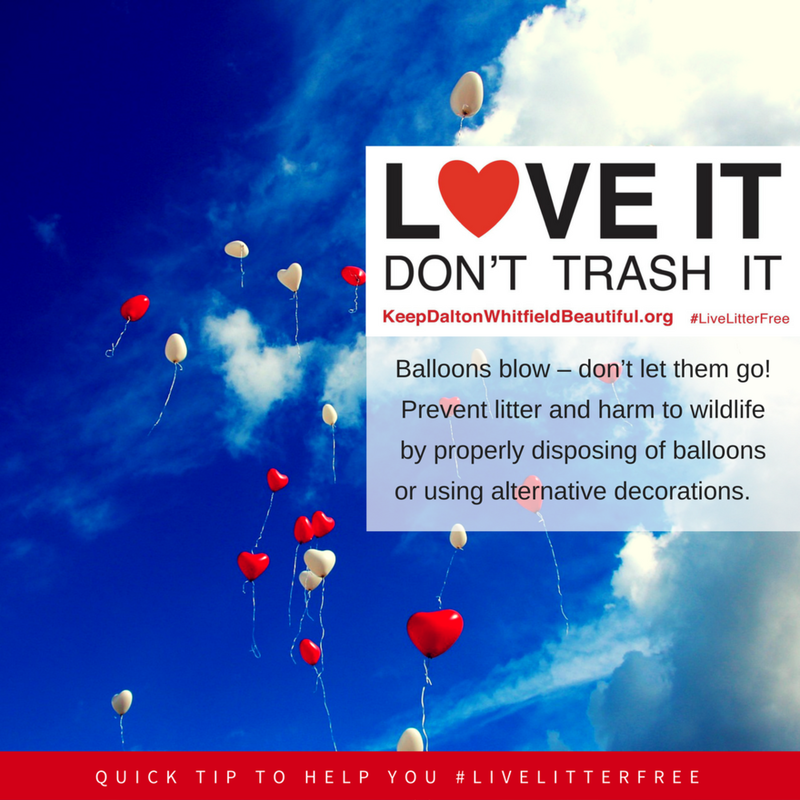 Prevent litter and harm to wildlife by properly disposing of balloons or using alternative decorations. 1. Litter is trash in the wrong place or misplaced solid waste. 2. Litter reduces property values because it sends a message that people don’t take pride in their community. Let’s clean it up! 3. Litter is illegal in all 50 states. Punishment can include a fine, and even jail time for littering and illegal dumping. 4. Areas that are clean are less likely to get littered. Clean up litter in your neighborhood for just 20 minutes a week. 5. 80% of our waterways are littered with trash that was dropped on land. Put trash in the right place to prevent litter. Thanks to everyone who sent in their slogan ideas, which were collected thru June 28, 2015. The Litter Prevention committee reviewed the submissions (almost 50 of them!) and narrowed it down to three slogans in July, then reviewed ad samples in early August. On August 19 the group chose the final version of the slogan, "Love it, don't trash it!" and the hashtag #LiveLitterFree. Both phrases were slight variations on slogans submitted by Eli Miranda and Robert Fernandez. You'll be hearing and seeing more about the new anti-litter slogan this fall and into the future. "Love it. 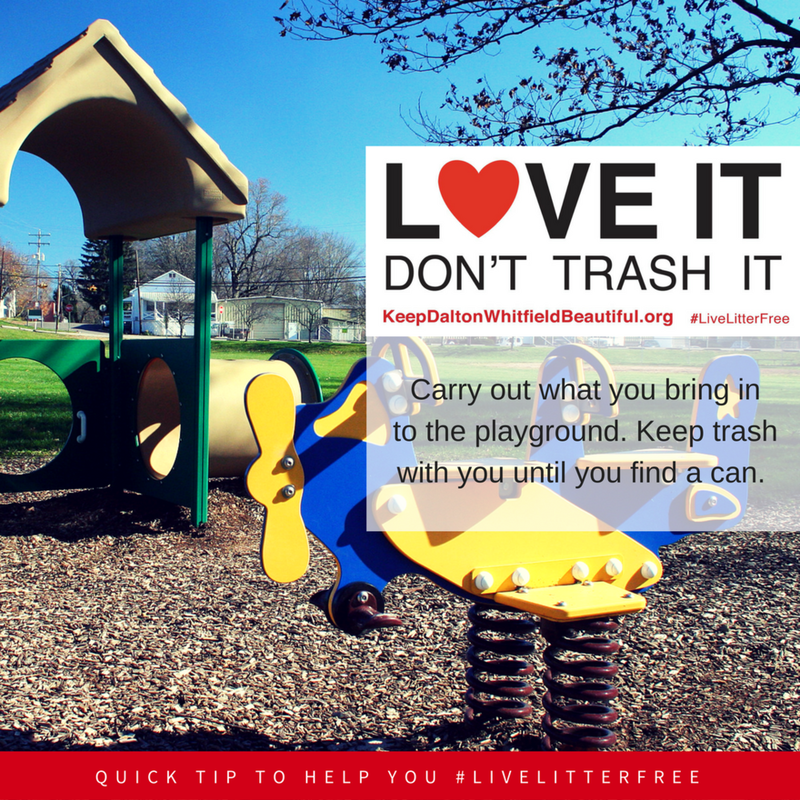 don't trash it" is the anti-litter educational campaign from Keep Dalton-Whitfield Beautiful. This is a sample image of what an ad may look like.